Onions may bring a tear to your eye, and pungency to your breath, but they will most certainly bring delight to your taste buds. It has an intense flavor and is a beloved part of the cuisine of almost every region of the world. Onion is a super healthy food with proven health benefits. Onion contains abundant amount of mineral called selenium which is known for improving overall immunity. It also has anti-bacterial and anti-inflammatory properties. The glycemic index of raw onion is 10 which is low GI and glycemic load of medium sized raw onion (approx. 75 grams) is only 1. Is Onion safe for Diabetics? Carbohydrate is the most crucial macronutrient due to which the blood sugar levels is impacted to a greater extent. 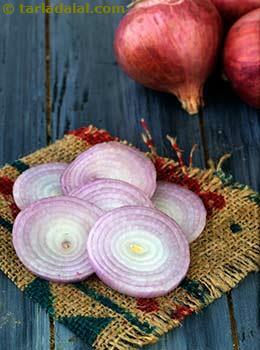 Onion is safe for diabetics because 1 medium sized raw onion (approx. 75 grams) contains only 8 g of carbohydrate due to which the glycemic load come down to 1. Since onions are very low in sodium, it is also suitable for regulating blood pressure. It is one of the richest source of flavonoids such as quercetin which aids in heart ailments. It also improves cholesterol levels that ultimately contributes to heart health. Is Onion suitable for Weight Loss? Being very low in calories (36 calories in 1medium sized raw onion) and having negligible amount of fats, it is a good option to include in weight loss diet plan. Replace onions over high calorie food mixed with other vegetables to reduce the overall calorie intake. Remember eating right amount of food including all five food groups with correct serving size is important. Until and unless the portion size of the meal is under control, losing weight might seem difficult.